When you’re driving your family around town, it’s likely that safety is at the forefront of your mind. So, why not purchase a family sedan that’s known for having awesome safety ratings? 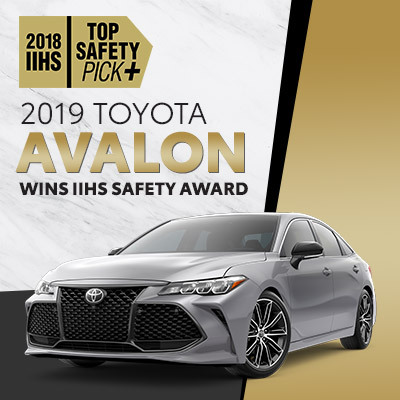 The 2019 Toyota Avalon was recently recognized by the Insurance Institute for Highway Safety with the organization’s highest possible safety title — Top Safety Pick+. The 2019 Toyota Avalon safety rating was awarded specifically to the Limited trim level, which comes equipped with LED projector headlights. This trim underwent a series of stringent safety tests, each of which evaluated the Avalon on its crashworthiness, crash avoidance technology, and mitigation ability. To earn the title of Top Safety Pick+, the Avalon had to earn the highest possible “Good” rating from the IIHS in the driver-side small overlap front, moderate overlap front, side, roof strength, and head restraint tests. It also had to earn an “Advanced” or “Superior” rating on its available front crash prevention technology. For the 2019 model year, the Avalon was built on the Toyota New Global Architecture platform, giving it a stronger chassis than its predecessor and allowing it to perform even better. This sedan also comes standard with the Toyota Safety Sense™ P package, which gives the driver access to a range of advanced safety features. This includes a Pre-Collision System with pedestrian detection, Dynamic Radar Cruise Control, Lane Departure Alert with Steering Assist, and Automatic High Beams. Test-drive the highly-rated 2019 Toyota Avalon at High River Toyota.